I have been writing poetry for as long as I can remember. About three years ago, I started writing short stories.Then, I found Anita’s Attic while surfing online. I was luckier still to be selected for the program based on my flash fiction submission. I spent two nights on the train every week, traveling from Kochi to Bangalore and back, being there for every single session. What more could a novice ask for than to have Anita Nair look at his or her work, personally? The blind spots in my writing of three years became visible to me af-ter eleven weeks at the Attic; clumsy sentences, superficiality in certain areas were just a few of these. I discovered how deeply connected the process of writing is to the clarifying of one’s mind and thoughts. The habit of writing with awareness, now touches the way I write emails, the way I think about myself, the way I interact with others. There is a freshness in my eye. It makes me notice and feel the world about me – something I keep forgetting to do. Along the way, I met some wonderful human beings, my fellow writers at the Attic. The laughter, the fun conversations we shared made me get on the train with enthusiasm every week, as much as, everything else the Attic offered. 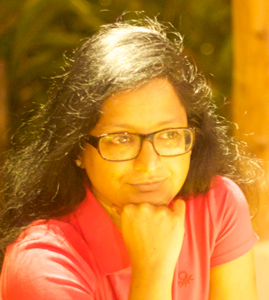 Swapna Menon is a bioinformatics consultant. She analyses high throughput data, generated from the research laboratories of American universities. She adores all the art forms – writing, painting, dance, theater, movies, music but dares practice just a little bit of writing. In the laps of nature, she loses her speech, her thoughts, her sense of time and all her faculties, save for the joy of being alive.